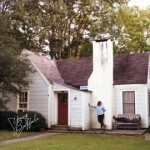 There’s nothing typical about the Oxford, Mississippi-based rock act Young Buffalo or the story behind their debut album, House. Although the group’s songwriters Ben Yarbrough and Jim Barrett didn’t begin playing under the Young Buffalo moniker until 2009, they started writing music together as teenagers and never ceased evolving. The band—which now also features drummer Tim Burkhead, bassist Andrew Guinn and keyboardist Will Eubanks—couldn’t be more excited to share their debut album House, an 11-track album produced by Dave Schiffman (Haim, Weezer) that establishes the five-piece act as a band that’s as unique as the town where they were conceived. There’s a timeless nature to House that sees it referencing the past while still remaining irrevocably relevant today. “When we’re writing we always want it to be something that we would want to listen to in the car or put on at a party.” Barrett explains. “We’re really honest with ourselves when it comes to what we create and that’s ultimately what keeps us interested to keep pushing forward,” he summarizes. With the good fortune of these five gentlemen being birthed in such a fantastically diverse city, both artistically and culturally, we are just thankful they decided to follow their musical hearts and form Young Buffalo. They are no doubt on their way to establishing themselves as one of indie rock’s brightest hopes.